How to Install Alexa in your car | Alexa and Amazon Echo in your car. Install Alexa in your car? It really is possible to add Amazon Alexa to your car. 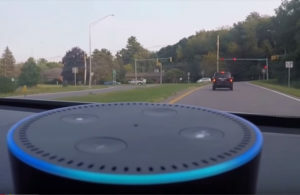 One of the nice things about adding Amazon Alexa in a vehicle is that you can truly be hands-free, and control several aspects of your car’s systems. In some vehicles, the functionality will be very different about what Alexa can do. So if you have any questions about this, and how it might work in your vehicle, please feel free to give us a call, or send us an email. The best feature about having Alexa in your car through an Echo Dot, is hands-free calling. But it’s not just hands-free calling. As of this writing, there are over 30,000 different skills that the Alexa system can do. All from the Echo Dot in your car, you can even control lights and any other aspects of your home. All you have to do is talk to Alexa in your car. Feeling groggy in your car on the way to work? So let’s say, you’re on your way to work, and you’re feeling a little groggy. You want a little pick-me-up. Instead of using your hands to control the radio, you can simply say something like this. Alexa will go and find you some upbeat music and it will start playing through the speakers in your car. Let’s say though, that you are still feeling a little groggy. You need something else to help pick you up. And Alexa will sync with the map program on your phone. And you will have instructions to help you find the nearest coffee shop. While you were in getting your coffee, traffic picked up on the way you normally take to get to work. Alexa will tell you what the traffic looks like on your normal route to work. Your car will tell you, through the speakers, what possible alternative routes might be better. Note: Of course this isn’t any different than what you might be doing with your smartphone now. However, it’s unsafe to be looking at your smartphone while you are driving. Alexa makes all of this a voice-activated reality right in your car. Let’s say that you then want to add something to your grocery list for picking up groceries later. And if you have set things up correctly, Alexa will add milk to your grocery list. Let’s say that you then remember that your son or daughter has practice after school. You want to remind your significant other to pick up the kids at 5. Alexa can make that phone call for you. Your voice will go through the Echo Dot, and you’ll hear the call through the car speakers. There are Alexa devices that will plug into a cigarette lighter adapter. So as soon as you turn on the car, electricity goes to the Echo Dot. Alexa starts up as soon as you start your car, and turns off as soon as you turn the car off. The electricity is coming through the cigarette lighter adapter. What about connections to your home automation or Savant system? One feature we find really cool, is the ability to connect to home while driving. And Alexa will turn on your home security system, while you’re commuting to work. No more forgetting to lock the doors! You don’t even have to pull up your smartphone in order to do it. You can simply connect Alexa to those controls in your home. Then use your voice to lock the doors should you happen to forget, but remember at the moment that you are driving down the road in your car. Or, let’s say that you realize the day is going to be cooler than you thought it was going to be, but you left the AC turned on at home, and you want to turn the thermostat down. While you are driving down the road in your car, Alexa will connect with your home automation system, to adjust the thermostat. One note on the hands-free calling from your car… You do need to have a phone that is Bluetooth enabled. Your smartphone also needs to also have a data plan. This can all be a little involved and confusing. We have posted some videos below to show some ways that people have used Alexa in their vehicles. However, if you have any questions, or if we can be of help for you, please give us a phone call or send us an email. Some set up tips as well as great demonstration of what Alexa Can do in your car. This one is based out of the UK. However it’s still relevant and helpful information. The part about how to install Alexa in your car starts about 1:25 into the video. Want help getting voice automation in your car?